Rutherglen is a rural township in north-eastern Victoria about 8 km from the Murray River, north of Wangaratta. It is situated in undulating country with no nearby stream, as its location arose from the discovery of gold. The nearest town, which is on the Murray River, is Wahgunyah, which predated Rutherglen by about five years. Rutherglen is in the Wahgunyah pastoral run taken up by John Foord in 1841. In 1856 Foord laid out his private Wahgunyah township on the river, ultimately developing it as a river port and trans-shipment centre for the district. In 1860 the Wahgunyah Rush township grew among a goldfield discovered about 10 km to the south-east. A hotel proprietor, John Wallace, brought a hotel building to the goldfield and the growing township was named after his Scottish birthplace, Rutherglen. Within a year it was estimated that the population of the Rutherglen gold diggings was upwards of 10,000. A school was opened opposite Wallace's Star Hotel in October 1860, along with Catholic, Presbyterian and Congregational churches. By 1862 the easily won gold was petering out and by 1864 there were fewer than 800 miners. A substitute industry was emerging, however, with over ten vignerons being recorded in the district in 1865. Their plantings occupied only 16 hectares, but by 1880 plantings occupied over 400 hectares and by 1886 they occupied 1200 hectares. In 1886 fifty vineyards employed 1870 people. In 1862, when the Rutherglen township had a high mining population, it was proclaimed a borough. The surrounding area, as far afield as Wangaratta, was proclaimed the Rutherglen Road District. 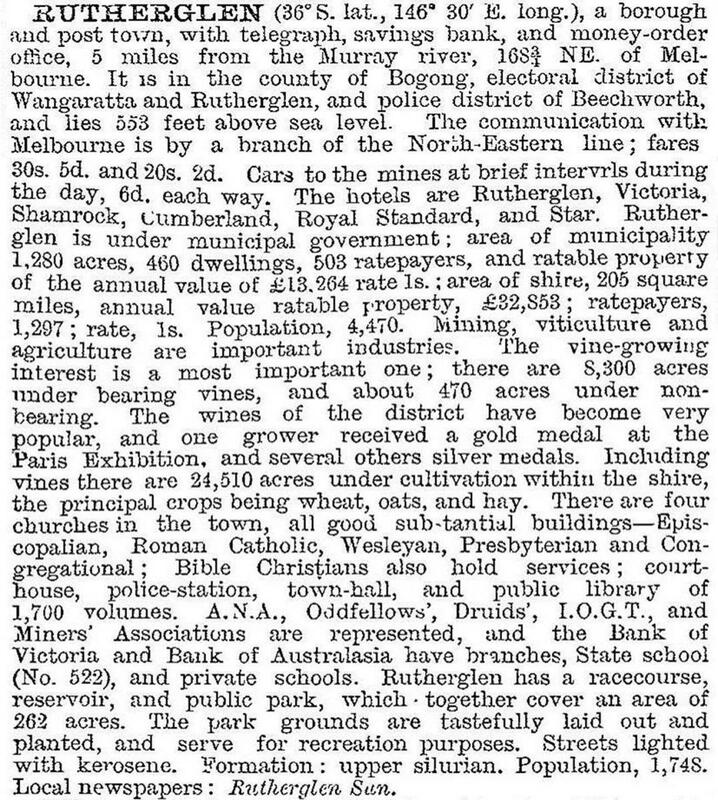 Its area, reduced in size, became Rutherglen shire on 16 June 1871. Both the borough and the shire councils had offices in the Rutherglen township. The borough was annexed to the shire as the Central Riding on 1 November 1920. As viticulture grew, deep lead gold mining also revived after dormancy in the 1870s. There was thus steady growth in both the borough and the shire. Between 1880 and 1900 the main mines were between Rutherglen and Chiltern, including North Prentice, Great Northern, Great Southern and Chiltern Valley. The mining activity absorbed timber, which created a local industry and cleared land for future farming. In 1879 the railway passed through Rutherglen when a branch line was opened between Springhurst and Wahgunyah. During the 1880s vineyards in southern Victoria were uprooted as the phylloxera infestation spread. In 1888, ten years before the infestation reached Rutherglen, a viticultural college was proposed on land between Rutherglen and Chiltern. By then north-east Victoria had over 60% of total vineyard plantings in the colony. The college was opened in 1897, two years before phylloxera was identified at Rutherglen. The college bred resistant American root stock and the replacement of diseased vineyards was undertaken. In 1967 the first Rutherglen Wine Festival was held. It was replaced with the Winery Walkabout in 1973, mainly to avoid antisocial behaviour in the town. Long standing vineyards include Chambers Rosewood, Seppelts, Campbell's, Stanton and Killeen, Jones, Bullers, and Morris' at Browns Plains. Revived vineyards include Mount Prior and Fairfield. Burgoyne's Mt Ophir vineyard, once one of the largest has not been revived, but its brick buildings and tower (1891-1903) are on the Australian and Victorian historic buildings registers. The vineyards produce a comprehensive range of table and fortified wines, and the region is best known for its muscats, tokays and ports. Rutherglen township has a shopping centre, three hotels, four motels, a caravan park, hospital, State secondary and primary schools, a Catholic primary school, Anglican, Catholic and Uniting churches, ovals and a showground, a golf course, a horse-training track, several sports clubs, an industrial estate and grain sheds and silos. Annual agricultural and wine shows are held in Spring, having begun in 1889. The railway line carried freight until 1995, when the service was suspended. A rail trail from Rutherglen to Wahgunyah was opened in 2006, completing a walk/cycle route from the Murray River and Wangaratta to Bright. In 1994 Rutherglen shire had 367 hectares planted with grapevines, producing over 2000 tonnes of grapes. Nearly 7000 tonnes of wheat were grown, and over 4200 hectares were grown for cereals. Grazing included over 12,000 head of meat cattle and 54,000 sheep and lambs. On 18 November 1994, the shire (which absorbed the borough in 1920), was united with most of Beechworth, Chiltern and Yackandandah shires to form Indigo shire. At the 2011 census, for Rutherglen and environs grain/cereal processing accounted for 6% of employment, beverage (wine) manufacturing 5.7% and farming 3.7%. Winds reported at 250 km per hour severely damaged buildings in the town in 2013 when struck by a tornado. Awnings and windows were damaged and trees uprooted. The Indigo Shire Council purchased Rutherglen's historic wine bottle-shaped water tower in 2014 to develop it as a tourist attraction with lighting and story boards to illustrate its history. The water tower, built at the turn of the previous century, had been decommissioned and turned into a wine bottle shape in 1969.